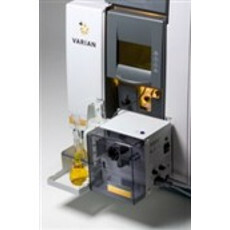 The Varian AA140 and AA240 are mid-range instruments which offer a high level of automation and easy-to-use software. The PC-controlled single beam AA140 and the true double beam AA240 AA systems combine the rugged and reliable hardware of the SpectrAA 50/55 with our acclaimed Windows based worksheet software. Use multi-tasking capabilities to start today's analysis while simultaneously preparing a report on yesterday's results. Imagine the productivity improvements that you will achieve by performing multiple tasks simultaneously. And of course, the AA140 and AA240 can be fitted with the full range of Varian AA accessories to provide extra capabilities. For example, shown at right is the Varian AA240 with optional Vapour Generation Accessory (VGA-77) and ETC-60 accessory. The ETC-60 enhances productivity of hydride generation AA by providing unattended, flameless atomization of the hydride elements. Find great deals on a huge selection on Varian Flame AAS in Auctions, and Classified for sale ads on LabX.